Robert Harvey oversees a training drill at the St Kilda Sea Baths. 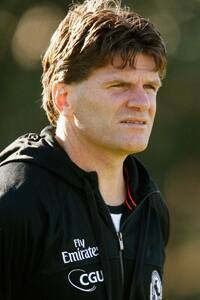 Collingwood midfield coach Robert Harvey has been named the AFL’s Assistant Coach of the Year. Harvey, who has just completed his second year at the club, follows in the footsteps of Neil Craig, John Longmire and Brendan McCartney who all went on to coach senior teams in their own right after receiving the award in past years. Director of Football Rodney Eade said that Harvey’s close relationships with his players has helped several Collingwood youngsters take big steps in their careers over the course of the past two years. “He reads the game very well, obviously being the midfield coach he’s got a great relationship with his midfield players, he puts across his point very well and his articulation is very good,” Eade told collingwoodfc.com.au. “At the same time, he needs to be harder when he needs to be hard but he’s got good empathy for the players so I think it’s good recognition of what he’s able to bring to Collingwood. Harvey entered last night’s Coaches Association Awards dinner unaware that he had even been nominated for the award and sees it as an encouraging milestone on a path that may lead one day to a senior coaching position. “Without knowing how they pick it, it’s good recognition that you’re maybe doing a couple of things right,” said Harvey. “I’ve still got miles to go from where I want to go to but it’s a good starting point for me. I still consider myself inexperienced so it’s good. As I said last night, I feel like I’m in a good environment to learn and to get better so I want to keep doing that here. “I still would like to push on and see how I go but I want to make sure I just want to get better in every area so if I did senior coach down the track, I’m ready to have a go at it. As the midfield coach, Harvey oversees a group that comprises established champions such as Dane Swan, Scott Pendlebury and Luke Ball, players entering their prime like Dayne Beams and Steele Sidebottom and rising stars Josh Thomas and Ben Kennedy. He says he approaches his role in a way that helps build honest but compassionate relationships with the aforementioned group. “Obviously I’ve got my own different style. I feel like I try to be as personable as I can and develop relationships and show care, but at the right time (being) honest and as straight as you can as well. But I’ve still got miles of improvement to go. “With the established guys, I think they’re pretty well set on their way well before that. It’s been good to just work with the whole midfield group and to see the younger guys come on. Harvey was a key part of a new look coaching panel when he arrived at the Westpac Centre at the end of 2011. He was one of five new faces to pick up a whiteboard, arriving alongside Rodney Eade, Ben Hart, Dale Tapping and Mitch Hahn. After living in each other’s pockets for two years, Harvey believes that Collingwood’s coaching staff is well positioned to drive their team to the next level next season. “It feels like we’ve got a better understanding of each other now and that there’s a good dynamic. We’re starting to get a bit more honest with each other as well. “You just feel like now we’ve got a good understanding of our strengths and weaknesses that we can go forward with a real conviction now and that’s going to be important. The 383 game St Kilda champion has seen several players come and go since his debut as a 16-year-old back in 1988, so his praise Dayne Beams, Steele Sidebottom, Josh Thomas and Brodie Grundy as stars of Collingwood’s future midfields should not go unnoticed. Nor should the work of development coach Tarkyn Lockyer whom Harvey allocates much of the credit for helping mould Thomas into a potent midfield weapon this season. Of Swan and Pendlebury, Harvey says that their approach to their craft makes them an inspiration to teammates and coaches alike. When shifting his focus to 2014, Harvey is crystal clear on what it will take to ensure that the midfield helps propel Collingwood back into the top four and beyond. “Collectively it’s getting our effort to a consistent level each week and then on the back of that getting the game plan to suit that as well and getting everyone on the same page with that. “I felt like we made good steps this year. I’m excited by it because we showed really good signs with our game plan and the way we played this year but I think next year, you’ve just got that excitement about going forward that it’s going to be very positive. Saturday’s Grand Final between Hawthorn and Fremantle will provide some clues as to what the 16 other clubs may look to implement in 2014. Harvey’s eyes will be on the miserly Dockers who are coached by Ross Lyon, who was coincidentally Harvey’s coach during his final two years at St Kilda. “I think the success of Fremantle means they’ll be looked at closely. “They’re a defensive unit so we want to improve our defence, clearly, but I thought our offence showed really good signs as well as our ball movement this year and I reckon going forward with the game that’s going to be crucial with beating these good defensive teams with how you use the ball. Harvey’s midfield protégée Scott Pendlebury was also honoured at the AFLCA’s awards night when he was presented with his AFL Coaches Association Champion Player of the Year Award. Pendlebury is the third Magpie to have won the award, following in the footsteps of Nathan Buckley (2003) and Dane Swan (2010).